Alfred Hitchcock, that great master of suspense, was fond of something called the ‘MacGuffin’. The MacGuffin is a plot device, typically a goal or desired object, which the protagonist pursues and in so doing, drives the action of the story. The MacGuffin does not have to be directly relevant to the ‘real’ story of the film. Indeed, quite often the MacGuffin is peripheral, or could be replaced with a different object: not quite a red-herring, but subservient to the end goal. And so it was with our BBC Newsnight film, The Hunt for the Golden Gun. The idea was simple, we wanted to find out what has happened to Libya since the revolution. The short answer is this: the country has fragmented into warring factions and the group that calls itself Islamic State is expanding in the power vacuum left behind by the collapsing state. The film is essentially a situation report or sit-rep. A sit-rep is by its nature very general and storytelling is all about the specific. That’s where the golden gun came in. 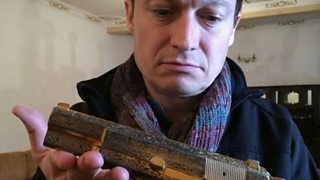 We used the hunt for Colonel Gaddafi’s legendary pistol as the engine of the story, as a vehicle to get us to the ‘newsy’ elements of the report. The trick in the edit was to keep two balls in the air at the same time - to keep the yarn of the search going, without losing sight of the main goal: what’s happening now? It was natural to see the gun as a symbol, not only of the transfer of power in Libya but also as an instrument of violence. As Chekhov noted, a gun introduced in scene one must eventually go off in another. In terms of storytelling, if it’s not going to be fired, it shouldn’t be there. ‘Hold on a minute’, I hear you say. Isn’t that the opposite of a MacGuffin? Chekhov’s gun is totally integral to the plot, rather than a mere vehicle. You’re right. Gaddafi’s golden gun had elements of both. The reason it made such a good vehicle for our sit-rep was precisely because it was also a Chekhovian portent. The gun at the beginning, in scenes of jubilation (below) following the Libyan dictator’s death, gives the viewer a sense of where we’re going and what we will find: a state collapsing into violence. For me, the most important and revealing scene in the whole report is the one in which a man shows us a picture of his brother on his mobile phone. The brother has been executed by Islamic State - shot in the head and then crucified. 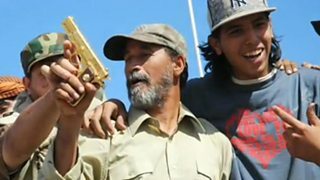 This image encapsulates what has become of Libya since the revolution: fear, unpredictable violence and guns everywhere. Our search for the golden gun was in one way merely a spine on which to hang the story of Libya’s collapse. We did eventually track it down but it would not have mattered necessarily if we hadn’t found it. Indeed when we set out, we didn’t know what we would find, what mattered is that we found out something about it. However, the film would have been less successful had we been searching for something more random: Gaddafi’s golden egg say, or a pair of golden slippers. Those might pass the Hitchcock test but they’re not quite enough for Chekhov.